I installed a WPC CPU from PINLED and the game does not start. 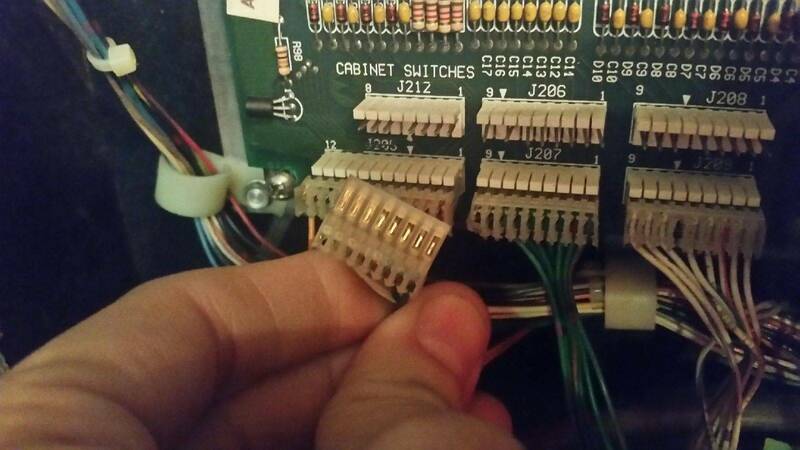 Unplug all the ribbon cables. Does this allow the leds to boot? What are the dipswitches set to? Post a picture of them please. Sorry I'm no help here with this one as I don't know anything about that CPU. Can you confirm you have rhe same problem after doing this? I recall having a boot up issue when I bought one a few years ago. I seem to recall the dipswitches had to be configured a certain way. I will try and find a picture. 6 or 7 is wrong since one of them should be off according to the chart. 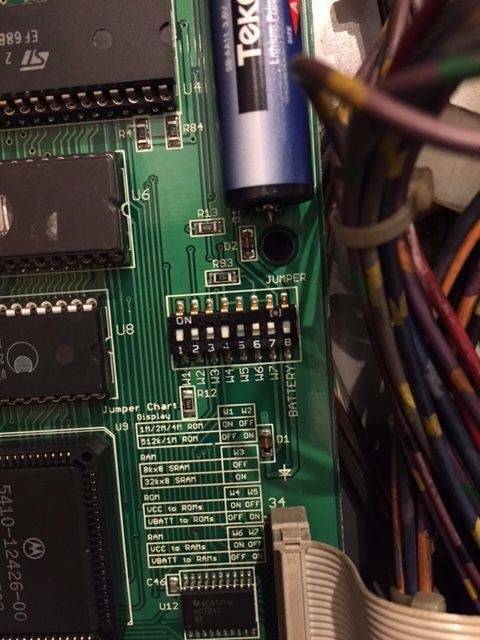 Those were the original dip switch settings when you received the board? I bought the card from another forum user, he used it in Indiana Jones. I'm out of the house now, I'll check the settings and let you know. You are welcome. I never did find that picture from several years ago. 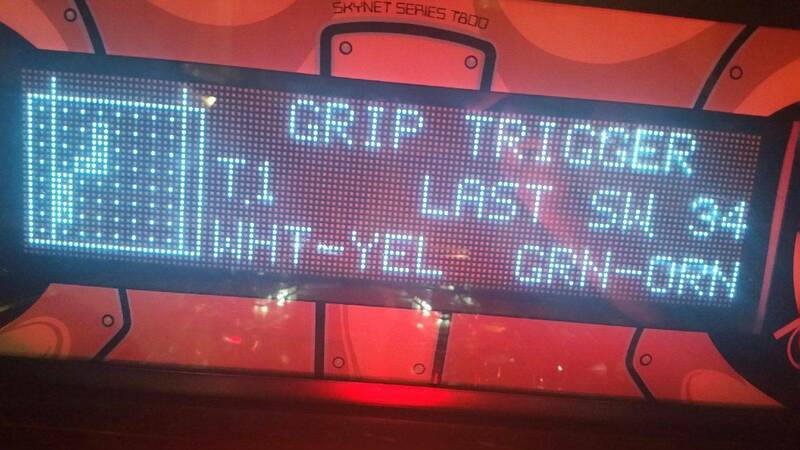 Is it holding the last scores and free play after turning the game off and back on? You can upgrade the board to NVRAM and remove the battery if you want, but it would need to change some dipswitch settings. The current battery should last over 5 years. I find it hard to believe it worked for him with those dipswitch settings. Try dipswitch W6 on W7 off w8 on. I do believe this to be true. Ok. I got a picture from my friend who bought the game with the PinLED MPU in it. Try this again. These are the setting on the board. With the power off, measure the voltage that is across the battery (the cylinder just above the switch). Can you measure this battery voltage? Since the battery has no voltage, do you want to locate a new lithium battery or install a NVRAM? It is possible that the battery discharged faster due to a shorted diode on the MPU board. Make sure it is a Lithium. Any others will leak. Hoping for some good news with the new battery. Battery not yet mounted because I have another problem. On test switch "always closed" appears and disappears as it is not active it does not work "gun shoter" as it is active it gun works. does any diode have a short circuit? Check to be sure the bottom right 2 connectors of the MPU board are not shifted over by one pin. Should be connectors J206/J207 and J208/209 depending on which connector the wires are plugged into. 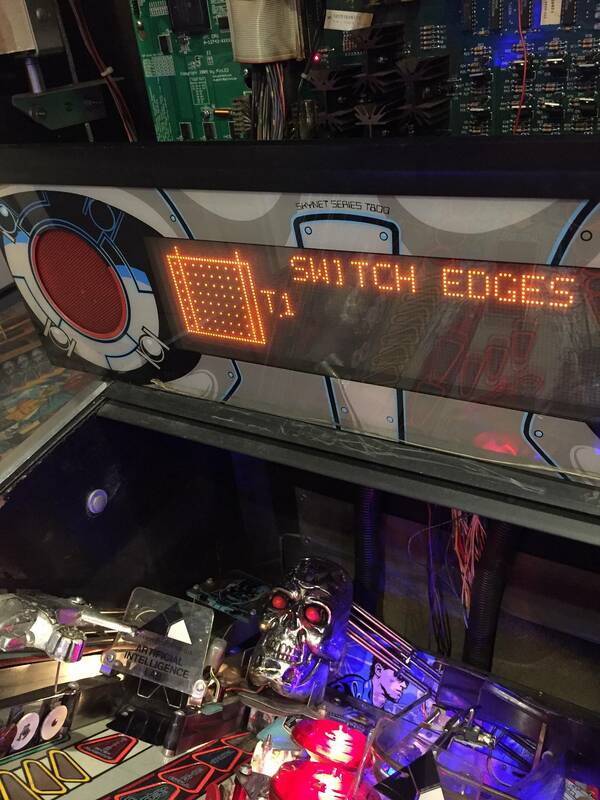 If they are connected correctly, test out all the switches in the game to see if you can narrow it down to a row or column of switches. All other switches work properly. Not sure I understand the problem with the gun shooter. If you are saying the Gun Shooter only works when the Always Closed is active, then yes, a shorted diode is possible. Also possible that the switch is wired wrong. Can you post a picture of the Gun Shooter switch snd a working switch in the same row/column as the Gun Shooter and Always Closed. The placement of the white and green wires on the switch need to match the same wire placement of a working switch. What is wrong with your original T2 MPU? 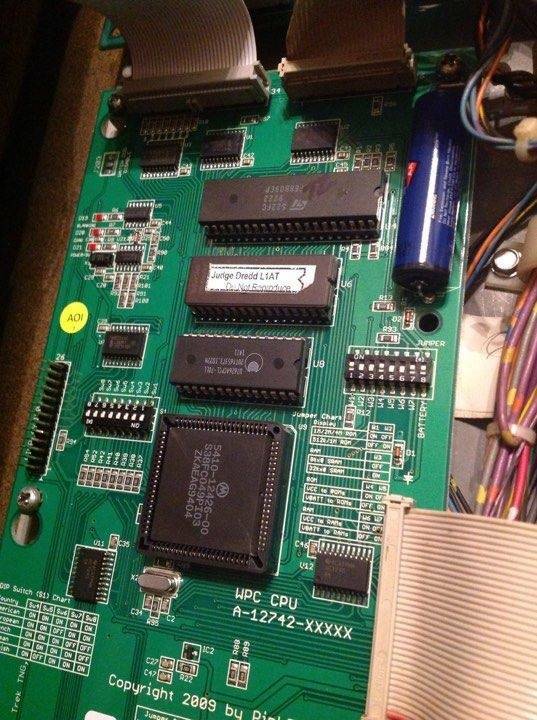 Since it seems you have 2 Indy Jones machines, can you swap a MPU into the T2 (swapping game ROMs) to see if it is an issue on the MPU board? Also keep in mind, the 'Always Closed' switch is not an actual 'switch', just a diode on the coin door interface board. 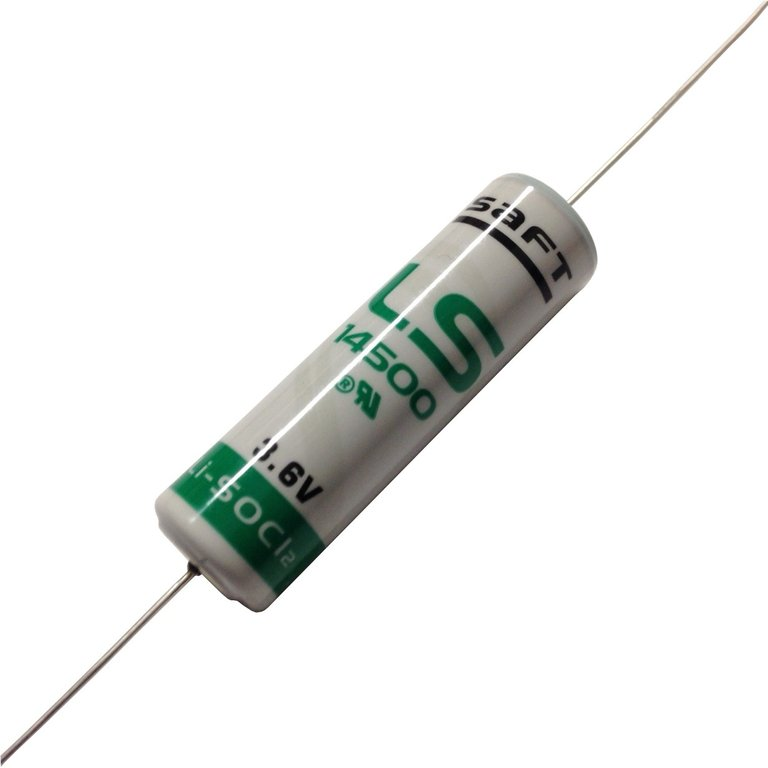 It's just a simple diode. Depending on the game's base OS (i.e. The version of the base OS), the game won't even boot up properly withtout seeing 'Always Closed' closed. If there is the same problem, I will check the plate, coin door. Which diode is responsible for "ALWAYS CLOSED" ??? Usually a round (but can be other shapes) flatish piece of crockery that is primarily used to hold food and made mostly from porcelain or China. Would you like to know what a knife and fork are???? Should be D2 on the coin door interface board. That's what the schematics say, I don't have a board on-hand to check against though. Probably a good time to change the battery on the PinLED MPU board since the problem is still some where in the machine. By chance, do you hear more than one switch activating when you pull the gun shooter switch? If so, this can signify a broken wire in the row/column. No, how it works is just one sound. switch always closed is inactive, gun does not work. Today I'm going to put a coin door board with Getaway and see. That sounds like a good idea, but I do not think both boards are compatible between these 2 games. Fly, on your post #32, your picture is not showing any normally closed switches on your DMD during switch test. Is that still the case with the Getaway MPU? Can you measure the 5v on TP2, 12VA on TP3 and 12unreg on TP1 of the driver board? Here you can see all the normally closed switches on my T2. Can you check the wiring for any corrosion on all these switch inputs at the bottom of the MPU? J212 goes to the start button and the gun shooter switch and I am suspecting you have some green or white battery corrosion on some of the pins. 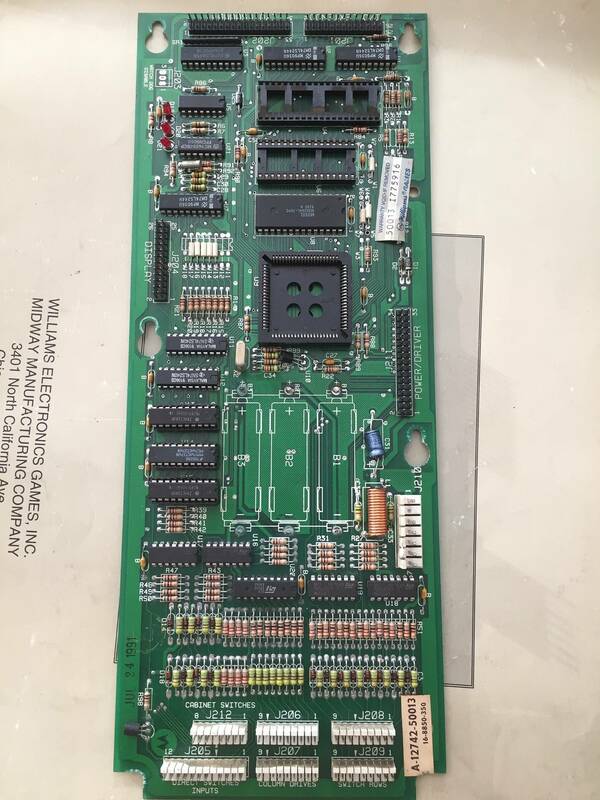 Which was a reason I was worried why the MPU board was replaced. 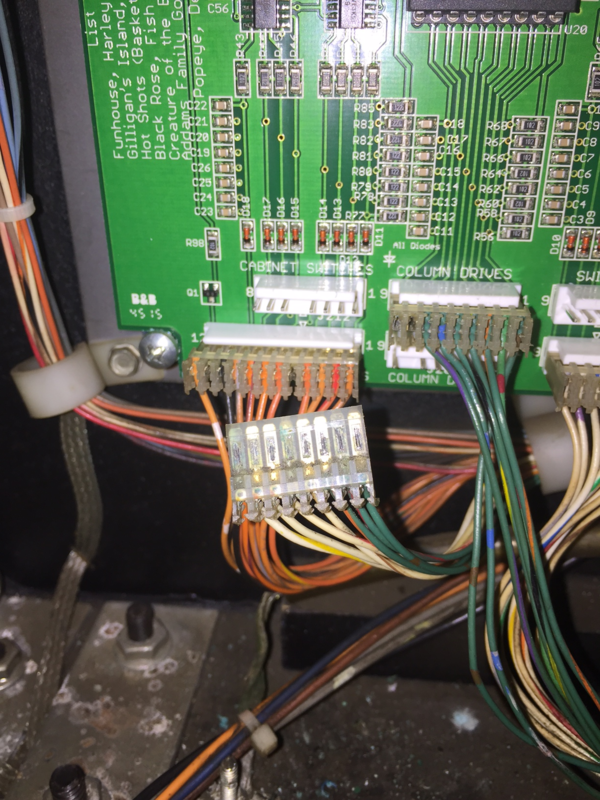 You need to check the other wired connectors as well at the bottom of the MPU as well. 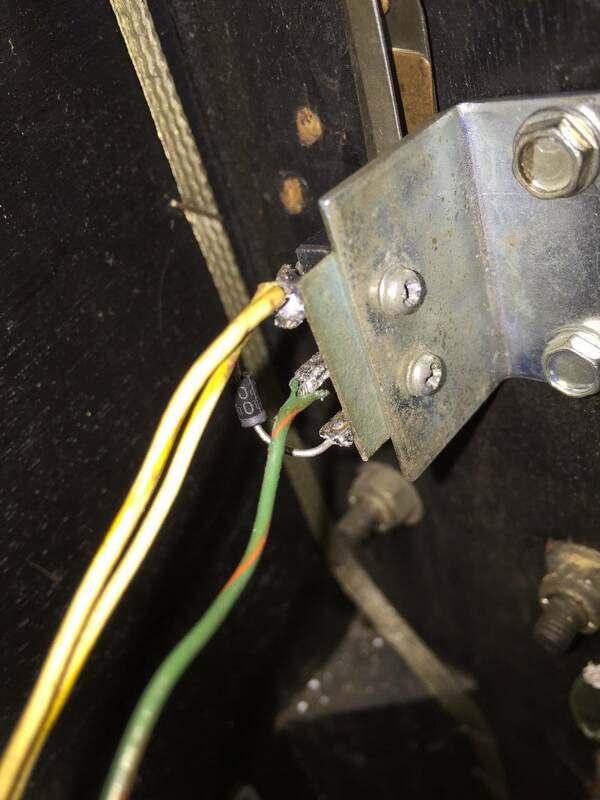 All corroded pins/connectors need to be replaced and likely need to trim off an inch of wire as well since the corrosion will run up the wire. The corrosion is causing high resistance and the reason for your closed switches are not showing up in the switch test. Did you replace the battery on the PinLED board? I was interested in knowing if the battery voltage is good now.